I’m currently in a revise and resubmit cycle with my dissertation committee. In brief the dissertation is written and will take some major work to complete to the satisfaction of all committee members. Mind you, I found this out 4 days prior to a scheduled defense date, so my body told me I needed to spend some time licking wounds before starting revisions. It’s amazing what a two week migraine cycle will teach you about self-care (hint: DO IT), friendship, and trust amid professional disappointment and setback. I can’t thank all my wonderful friends and colleagues enough for their support and encouragement and laughter and love during this time. UPDATE November 26, 2013: Now available at the USA Today! UPDATE November 4, 2013: Now available at the Huffington Post! UPDATE August 8, 2013: Currently this post is at ~300,000 views (298,742 to be exact). THANK YOU INTERNET! Welcome!! Over 48,000 of you, most likely current or former graduate students, stopped by to say hi and laugh just yesterday alone. Most of you found this post via a link shared on Facebook or Twitter. I’m so glad you are here, and I hope the post made you laugh and cheered you up. I drafted this post at an incredibly low point in writing my dissertation. I felt horribly alone in the struggle to finish and honestly just felt so hopeless about ever finishing. I still cycle through these emotions. At another low point recently I glanced at my blog stats and was just flabbergasted by how many folks have visited this past week. A great many of you have left comments, shared your experiences, reblogged the post on your own blog, shared the link with others, and liked the post. You cannot imagine how beautiful this gift is to receive from you, and I don’t know how to truly express my gratitude to you all. Even though we must all overcome our own individual struggles to complete our own PhD/graduate school journeys, I am forever grateful that to plainly see that we are, truly, not alone here. Thank you for stopping by, and I truly hope your journey is successful, fruitful, productive, and OVER AS SOON AS POSSIBLE. THE ONLY GOOD DISSERTATION IS A GOOD DISSERTATION – GET ‘ER DONE!! 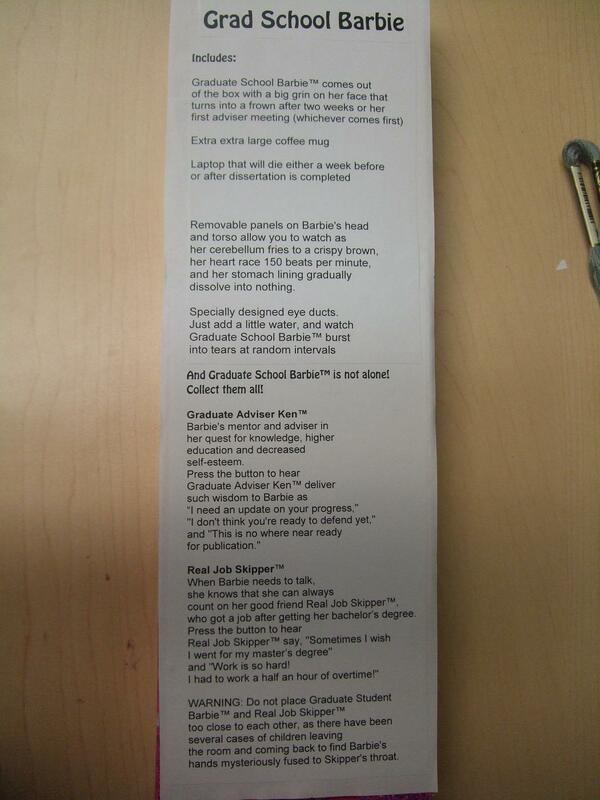 Graduate School Barbie comes in two forms: Delusional Master’s Barbie (TM) and Ph.D. Masochist Barbie (TM). 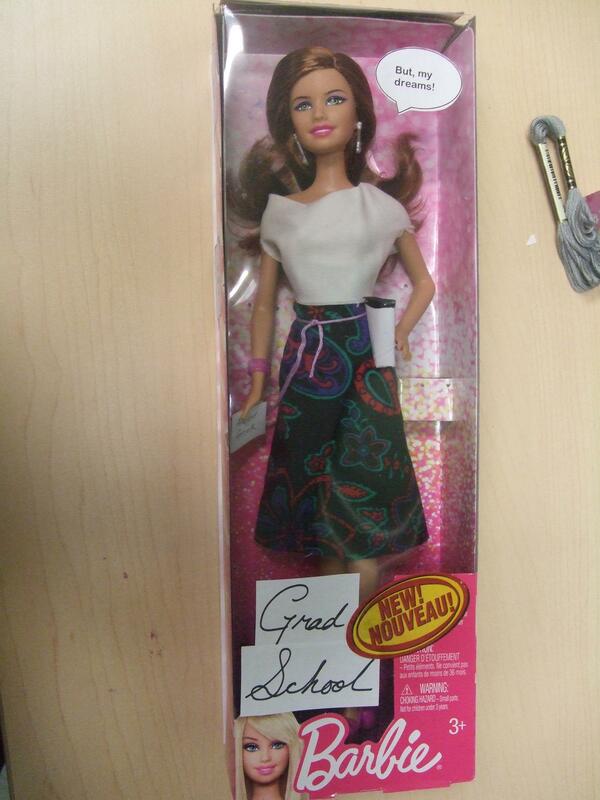 Grad School Barbie is anatomically correct to teach kids about the exciting changes that come with pursuing a higher education. Removable panels on Barbie’s head and torso allow you to watch as her cerebellum fries to a crispy brown, her heart race 150 beats per minute, and her stomach lining gradually dissolve into nothing. Deluxe Barbie comes with specially designed eye ducts. Just add a little water, and watch Grad School Barbie burst into tears at random intervals. Fun for the whole family! Grad School Barbie’s Fun Fridge (TM) Well stocked with microwave popcorn, Coca-Cola, Healthy Choice Bologna (99% fat free! ),and a small bottle of Mattel Brand Rum ™. Grad School Barbie’s Medicine Cabinet comes in Fabulous (pepto-bismal) pink and contains Barbie sized bottles of Advil, St. Johns Wort, Zantac, and your choice of three fun anti-anxiety drugs! (Barbie Medicine Cabinet not available without a prescription). Grad School Barbie’s Computer Workstation. Comes with miniature obsolete PC (in pink of course), rickety desk, and over a dozen miniature Mountain Dew cans to decorate your workstation with (Mountain Dew deposit not included in price. Tech support sold separately). 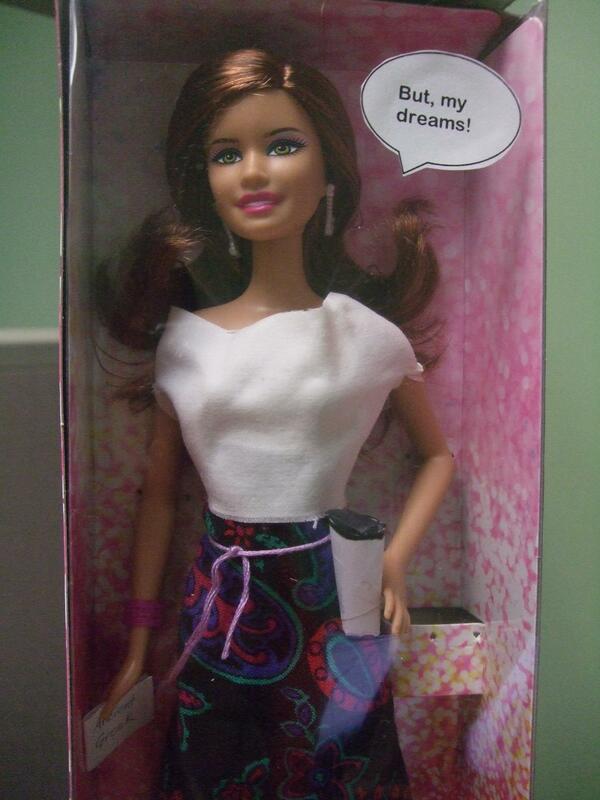 And Grad School Barbie is not alone! Order now and you’ll get two of Barbie’s great friends! 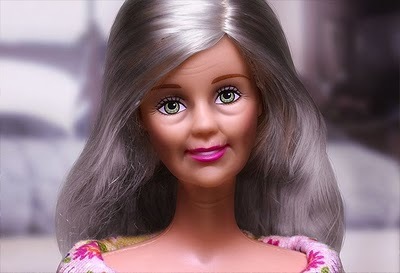 GRADUATE ADVISOR KEN, Barbie’s mentor and advisor in her quest for knowledge, higher education and decreased self esteem. REAL JOB SKIPPER, When Barbie needs to talk, she knows that she can always count on her good friend Real Job Skipper ™, who got a job after getting her bachelor degree. Press the button to hear Real Job Skipper say, “Sometimes I wish I went for my masters degree” and “Work is so hard! I had to work a half an hour of overtime!” Real Job Skipper’s Work Wardrobe and Savings account sold separately. WARNING: Do not place Grad Student Barbie and Real Job Skipper too close to each other, as there have been several cases of children leaving the room and coming back to find Barbie’s hands mysteriously fused to Skipper’s throat. Somedays I am the student freaking out. Other days I grab the available seat. I recently found out that I had a month less than anticipated to hand in the complete draft of my dissertation. If it is in good enough shape by July 1 and my committee members are available, I may be able to defend this summer. The hustle is ON. Agranoff (2008) concluded that these results were beneficial for individual member agencies and described this synergism as “reinforcing human capital growth by the benefit of successes” (p. 344). However, Byles (1985) notes that “collaboration requires more than the sharing of responsibility; it entails working together closely and observing each other’s performance – the dissolution of agency boundaries” (p. 553). Yes, it’s quote heavy and some of them will need to be summarized rather than quoted, but PROGRESS.